In the summer of 1974, Michael Bradley joined his school friend's band in Derry. Four years later, with Bradley providing the driving bass rhythm, The Undertones released 'Teenage Kicks' and were propelled to fame. This is the fascinating story behind the man, the band and the song. Michael ‘Mickey’ Bradley continues to play bass with the Undertones, who reformed in 1999. He is also a radio producer with BBC Radio Foyle. A beautifully written book full of gentle humour and self-deprecation - made me laugh-out-loud many times on the train, eliciting odd looks from strangers! It's fascinating to see the evolution of your favourite band when all you were aware of at the time was the music. Thank you Mickey Bradley. If ever a book carried the voice of its writer, this is it. It’s funny. Very funny in places. But Michael also dishes out a little poignancy and plenty of colour, not least in describing his surroundings. It’s not dewy-eyed nostalgia for greater days though, and rarely does he go into flights of fancy. If he senses himself getting into pretentious territory he knocks himself back into line. Before I opened this book, I felt I knew most of what was worth knowing about The Undertones from old press stories, two great documentaries and all those fantastic songs and sleeve notes. But he adds so much more. In short, a quality read and everything I hoped for. A joyous read. Immense modesty and full of great humour, capturing an important time in cultural and political history - loved every page of it. Loved the writing style, reading it brought me straight back to Derry in the 70's. Humour and insight. I want more! Refreshing, witty and gripping reflections on the birth and growth of a unique sound. Great read...but when I bought it someone had already written their name inside the front cover ! !...somebody Bradley I think it was. Mickey Bradley has produced a wonderful book of memories told in a detailed, sincere and entertaining way. Kids forming bands today would benefit from reading this story, the ups and downs and highs and lows of showbiz, and the importance of staying true to their roots. It is nostalgic, witty and a joy. I recommend it highly. Great book. Very funny and a reminder of why The Undertones were (are) one of my favourite bands. A fascinating and inspiring tale. Honestly told of how some teenage boys from Derry had the talent, drive and passion to break out of Derry (which seemed quite unlikely at the time they did so). The author was genuine and inspired me to take a recent trip from Scotland to the fascinating city of Derry to find out why The Undertones? A brilliant read, well written with lots of interesting memories and recount of the life and times in the band. Great book by a great artist who was in a great band! Mickey was always the chattiest of The Undertones, which led to frequent problems on stage when he and Feargal Sharkey used to speak at the same time, and Paul McLoone is maintaining the tradition... This is a witty and self-deprecating insight into life in a properly brilliant band. A lovely, honest, witty story, no stone left unturned, looking forward to next instalment. 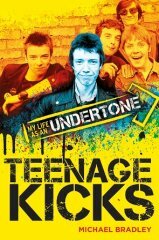 Brilliantlly written book, warts and all, about the rise of the Undertones. Very truthful and witty and a must read for any music fan. One of the best music biographies I have read in years !! A thoroughly enjoyable read. Bradley's often humorous account of the Undertones reluctant engagement with the rock music industry is a welcome and refreshing addition to the genre. Pure Derry punk! Terrific book, captures the feel of the time perfectly. A brilliant book. Well written, honest and funny. A must read for any music fan. I found the authors style very laid back and highly amusing. In fact at times I literally laughed my backside off with his colloquialisms. Best birthday. Present I received in years and thanks for signing up Mickey! Best book for years about being a member of the worlds greatest band. Brought back the essence of the days! An excellent book about a fine band. Very sad and extremely funny in places and well worth reading. Best music book I have read in a long time. The only smiles I had on a truly lousy family holiday were provided by this wonderful book about one of my favourite bands. A brilliant book, a brilliant, life changing band....all written by a great bloke. A must read. Great book, cracking read. Well deserving of a nomination and hopefully the win!